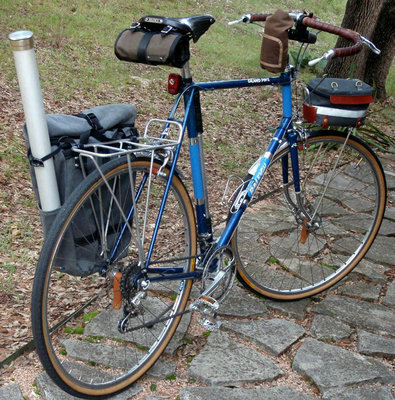 so I'm getting into bicycle touring,,, I'm looking for a glass rod with many sections I'm talking maybe a 6'6" with 6 sections. I've seen one before that was traded at the bears den and honestly the action didn't feel bad. action isn't really the priority here because I've used a long tree branch to tenkara fish before and I was fine but getting it packed into a pannier side bag is, who could I talk to about this project? Someone was selling a vintage REI that is a 8' 5pc 6-7 wt rod. 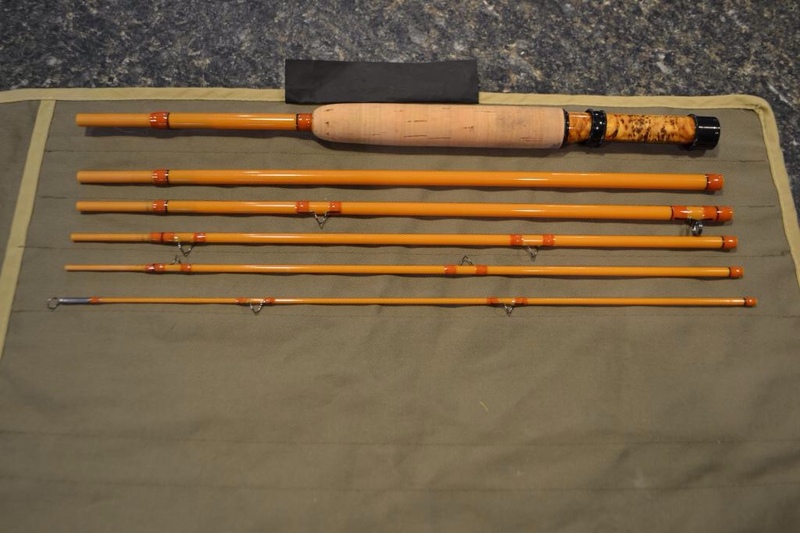 Lamiglas made a vintage 6pc rod at some point, but they are hard to come by. Wright and McGill had the trailmaster 5&6pc spinfly combos that are indestructable, cheap and for the most part, not great rods other than their size. 6/7 wts. But for what you're talking, as long as you don't mind a light line weight (2wt, 3wt, or 4wt) the axisco rods would be great. I think your best bet is going to be a Japanese rod. Epic makes a 7' 6" 5pc and the vintage 4pc fenwick FF70-4 might be small enought too. Chris Barclay was also planning on releasing a 5pc rod, but it's going to get into the more expensive range. Or just get a tenkara rod. They're easy to order, just expect all communications to be delayed by a day. How about that Carl, what did they used to say, I owe you a Coke? Biking, I go with the Tenkara rod. If you are willing to build it out, awhile back I bought two 8 piece blanks from a forum member. 6' 6" spigot ferule. Each section shorter than 12". I can't find pm's to remind me of the details but I think it was mtnbrook. They are mustard colored and I think were his "native" series. He may still have some in stock. If not, I would part with one of the two I bought. I can't speak too much for the action, because the first one is only partially put together, but like you, I was looking for pack size functionality. In the wiggle test it seems sufficiently limber. Bulldog nailed it. 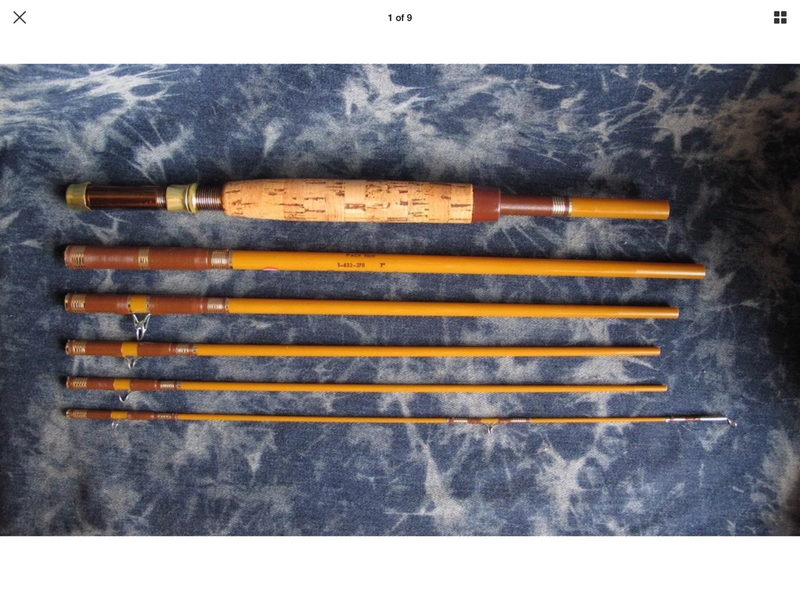 In addition to the Axisco stream rods (portable and a good rod), there is also a nice 3/4wt lamiglas in a 6 PC but do not show up often. This one built by a forum member (Colt) is a great example. I love my Axisco 10 PC airrite. A gladding outdoorsman is a 6 piece. If 5 piece okay then the lamiglas Galaxy is a decent rod. So are the berkley Buccaneers in the buckskin color models. Shown after citrus strip and new guides/wraps. The 2/3wt bears den is a nice pack rod but the airrites are hands down a way better rod, IMO. Other options (rare) include Scott anniversary 5 piece, Steffen bros 5 piece, REI 5 piece, and Abercrombie. Blue Dun is a great fly shop and shipping is very fast. 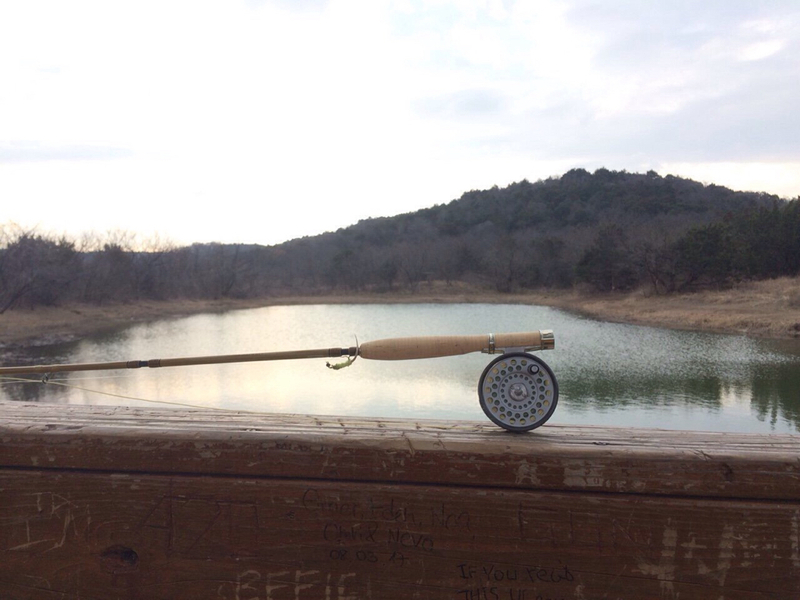 Another vote for the Axisco Airrite 6 piece rod. I have one and love it. I just checked the price from Blue Dun And the 7' 3wt. is approximately $300.00 with shipping. Blue Dun is a top notch dealer and they ship quicker than some US dealers. Someone posted this telescoping fly rod on a fly fishing facebook group. Looks ok, and only $30. can't leave out the Tiemco Fenwicks! Those Melody rods look like the Bears Den 8 PC rods. If the same they are quite limber. I'm not sure "limber" is the word for those 8 pc. rods from Bear's Den. I think you could tie knots in that thing. A 3" bluegill will flex it into the grip. Casting takes a lot of attention. I think I used it once and put it away. 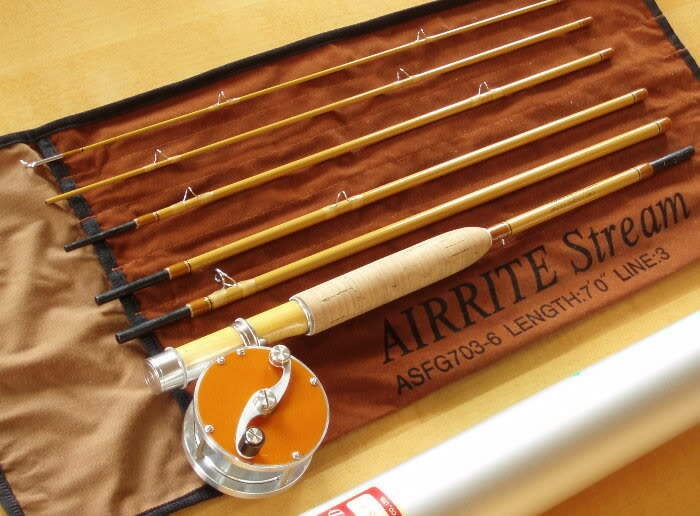 But the Axisco Airrite as many have mentioned is a sweet rod. Looks like all of the glass travel rods shown above have spigot ferrules. Would seem tip over ferrules might produce a better action. Thoughts? Good Q, Matt. I have an idea they would make good continuity, such as you can have it with that many ferrules, harder to achieve. I don't know that I could make a very good theoretical case, though. A reason against the idea is probably much simpler: more expensive to manufacture with separate mandrels for that many sections would be my guess. As soon as I say that, someone will come up with a description/photo/or link to a rod made just that way. Because a spigot ferruled rods are made from one blank cut to sections,, to me anyway, they inherently have the potential for better continuity of action, but I guess the spigot length of engagement and fitting can be pretty fussy on a many-section rod, too. Twas me, I'd have a two-section rod 7 1/2' feet or less and lash it vertically in a small diameter tube to my pack or cycle frame. That's the way I always did it years ago. That was a motorcycle, though, so there might be a disadvantage on a bicycle. Multisection rods to me, although they might seem handy for transport, become a nuisance to use because of all the assembly and potential ferrule loosening to check while fishing. I hope I'm wrong for the guys that have that down. I had one that I used a few times that fished just as well as the rod I substituted it for, but I couldn't give it away fast enough afterwards. Yes limber was a bit of an understatement it is the ultimate in tippet protection. JP Ross makes a fine 7' 3wt 5-piece, I think called the Muir. I built one from a blank last year and I really like it. I have a Winston 4 piece BIIX that I travel with. Great rod. How many times do you watch Blazing Saddles before you change your name to Hedley?